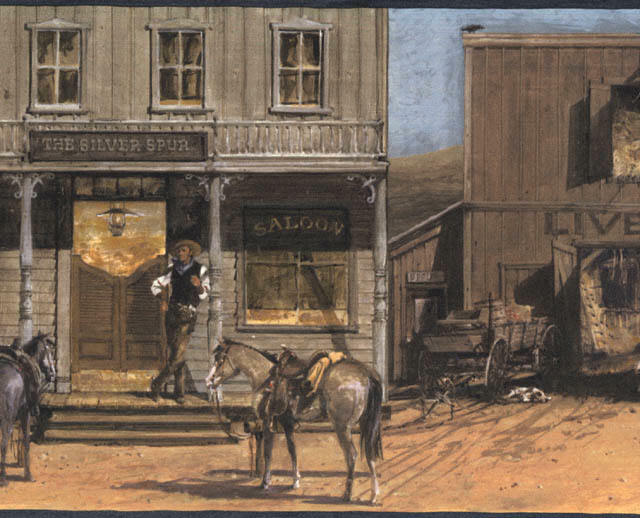 Jas had just gotten into town and thought he'd head over to the saloon for a drink. The road had been a long and dusty one. He didn't even get inside the saloon when someone started shooting at him. The first shot missed him, but the next shot caught Jas's right wrist. He then picked up his gun with his left hand and shot the cowboy, killing him. Somebody was still holding a grudge on Jas from Bitter Creek. Some of the men folks helped Jas over to the Doc's office. The sheriff heard the shots and followed Jas to the Doc's office. Jas asked him if he was going to put him in jail. The sheriff reassured him he wasn't going to arrest him. He felt that Jas had taken more then was called for and besides Jas shot the cowboy in self defense. 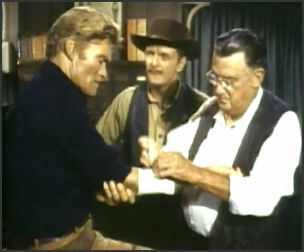 The sheriff told Jas there were a few others that were itching to start on Jas where he left off about Bitter Creek. He told Jas if he were him he wouldn't hang around here for very long. Jas told him he had no intention of hanging around, Jas said he had business elsewhere. While Jas was trying to pull his sleeve down the Doc told him he was to take it easy, that he almost severed a tendon. He told him not to use his hand for at least two weeks. Jas was on his way to see an old friend, Sam Whitlaw, he was too late to see Sam. Sam was already dead. He did make it in time for his funeral though. After the funeral Jas saw a commotion going on between some people and a young boy. The boy was Jimmy, Sam's boy. His Uncle Caleb & Aunt Hannah wanted him to go home with them, but he refused. He wanted to go home with Neela, not his aunt and uncle. "No Jimmy.....come with me, come to your own home!" Yelled Neela as she reached for Jimmy. Jimmy turned to his aunt and said....."I want to go with Neela!" "No Jimmy.....your fathers not there anymore," said his aunt. Caleb turned to Neela and said....."Get in your wagon. You're only going back to the Whitlaw farm to get your things together." "The boy will live with us now!" As Jimmy struggled to get away from them he was yelling....."But I want to go home! I want to live with Neela!" Neela told them they had no right to take Jimmy. "Don't you start questioning our rights!" Stated Caleb. Hannah was saying that it was a mistake to let Neela come to the cemetery. This was the time for families and close friends. Jas intervened....."This isn't the time or the place to argue. I'm sure it can wait 'till later!" Just then Jimmy broke loose from his uncle and ran into the arms of Neela. Caleb told Jas that he had family rights to Jimmy. He told Jas that Sam Whitlaw was his cousin. Caleb asked Jas who he was to step in and take over. "I'm Jason McCord.....Sam Whitlaw was my friend." "Well that's easy to say now that Sam isn't here to.....back it up!" Said Caleb. Jas told him to let the law decide. "I'm the mayor of Sandy Creek.....I am the law here," said Caleb. "Obviously the boy wants to stay with the woman," said Jas. "Woman? Sam's squaw housekeeper.....that's who she is!" "We're going to ship her back to the reservatio n fast. I always said she was a bad influence on Jimmy. Hannah and me will give the boy a decent home now," said Caleb. Jimmy was crying....."I got a home," yelled Jimmy. Caleb told Jimmy they were only thinking of his further. Jas convinced Caleb to wait a few days and let the boy go home with Neela. "Well I suppose it could wait until tomorrow," said Caleb. Jas went with Neela back to Sam's ranch. He told Neela when he surveyed Sam's land a month ago he looked healthy as a young man. Neela told Jas that Sam had gotten the fever and in three days he was gone. They had tried to get the doctor from Elks Bend but he couldn't come. Neela then started to get in the back of the wagon. Jas told her she was to sit up front with him. She was surprised. Jas told Neela that he was bringing Sam good news. He told Neela that he checked his survey against official government maps, he was a lot richer then he thought. Neela knew it had something to do with the water. Jas told her that Sam held the riparian rights to Sandy Creek and he owns the land where the water flows into Willow creek. Neela told Jas that Mr. Reymer claims that land. Jas told her that right now that land belongs to Jimmy. Now things started to add up. This is why they wanted Jimmy. They didn't care about anything except the water. "Well if it's the way Reymer claims and Jimmy is his relative, the law will probably make him the boy's guardian," said Jas. Neela got upset....."NO! His father would never want that," said Neela. "His fathers not here to say and you can't fight a whole town!" Stated Jas. Neela grew more upset....."Yes I can.....if they try to take Jimmy!" Neela grabbed Jimmy and held him, she then kissed Jimmy. Neela was not giving Jimmy up with out a fight, not if she could help it. Jas knew Neela meant what she said, now he had to try & help her more then ever. When they got back to Sam's ranch Neela made them some supper. Jimmy asked Neela if she owned the farm now. 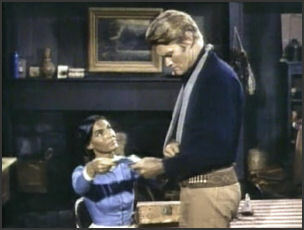 "No Jimmy.....um.....an Indian is not allowed to own land, except on a reservation," said Jas. "You own the farm now.....you're the head of the house!" "Neela works for me?" Asked Jimmy. Jas told him that they worked for each other. Neela thought she heard something outside. She walked over to the window. Two men were riding in on a buckboard. Jas walked over to the window and saw that one man was Reymer and the other Huber Mills, Reymer's heavy. He told Neela and Jimmy to stay there while he went out to see what was going on. Reymer told Jas they came for Jimmy. Jas reminded him that they would get the boy tomorrow. "Postponing just makes it hard," said Reymer. "Jimmy can go with you if that's what he wants, but it's up to him," said Jas. "You expect us to leave him with that squaw if he wants it?" Questioned Reymer. "Why he's only a boy.....he don't know." "She'd raise him like a red skin savage!" "One day he'd have feathers in his hair and his face painted!" "Maybe you're partial to red skins," said Mills. Jas called to Jimmy and told him to come outside. Reymer told Jimmy to get his things together, that he was going home with him. "This is my home.....I own it now!" Said Jimmy. "I want to stay here." Jas told them that was their answer. Mills told Jimmy he was getting to big for big his britches as he started for the boy. Before he could put a hand on Jimmy, Jas hit Mills knocking him to the grown. Mills started for Jas but Reymer stopped him and told him there was other ways. Reymer told Jas that they would have to go to town eventually and he was going to make sure that no one would sell them as much as a measly potato. "When Jimmy gets hungry.....he can always come and sit at my table," said Reymer. The whole time Jas held a gun on them. They turned and headed for town. Jas told Jimmy that he was big enough to help Neela with the chores. "She's used to it.....she's a squaw" said Jimmy as he ran off. Neela was hurt. She turned and went into the house. Jas followed her. "That's the way he's been for two days now. He hardly speaks to me, except when he can't help himself," said Neela. "His father dying.....that's what it is," reassured Jas. She turned to Jas as said....."No.....it's more then that! He knows how the people feel about me and he's ashamed." Neela started to cry....."Can I face all of Sandy Creek and Jimmy too?" Jas walked up to Neela, it was hard to say what he was thinking, but it had to be said. "Maybe it would be better for you and Jimmy if you.....did send him to the Reymer's and you went back to the reservations." "No I can't do that! You don't understand.....I can't give up!" "Jimmy's my son!" Jas was surprised. "Fifteen years ago I fell in love with Sam Whitlaw and he loved me." "We wanted to be married in the white world, but we were turned away everywhere. So we were married in the Indian way, my village." Nobody knew, they didn't tell anybody because Sam was afraid of the way he would treat them. "So after Jimmy was born we moved here and Sam told everyone that his wife died in child birth. In a way.....that was true." "I became nurse to my own son, but Sam and I had our happiness and that was the only way." Jas asked Neela if she had any proof to back up her story. She nodded and then when to the dresser and got out a box. Inside the box was a deposition sworn by a circuit judge. This certainly proves Neela was Sam's wife. Neela looked at Jas with a big smile on her face and said....."Now tell me to give the boy up!" "Why haven't you told Jimmy?" "I was afraid.....I was afraid of how he would face the truth," said Neela. 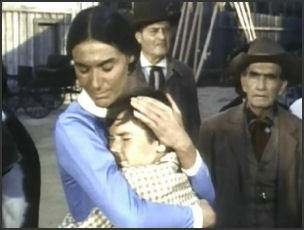 "He thinks his mother is dead.....a white woman, not an Indian squaw." "I can face anything.....but not my son tuning away from me," as Neela sat there crying. Jas went looking for Jimmy; he wanted to talk to him. He found him down by the pond, just setting there, thinking. Jimmy didn't feel like talking. Jas asked him if he was ashamed of something. He reminded Jimmy that he had told Reymer that he wanted to live there with Neela. Jas asked him why he was acting funny lately. Jimmy shrugged his shoulders and said he didn't know. Jas asked Jimmy if it was because Neela was an Indian. Jimmy reluctantly agreed. Jas told him that Neela has always been an Indian, but that didn't stop her from loving him or caring for him. Jimmy told Jas that was when he was little and needed tending. Jimmy started to pour his heart out. "You don't have to listen to the kids calling you papoose or redskin.....it ain't fun!" Jas asked him if that would solve the problem if he sent her to the reservation. "Well maybe she would be a site happier living on the reservation with all the other Indians!" Yelled Jimmy. Jas reminded Jimmy that she has lived there all her life with him & his father and this was her home now and he was her people. "Well there's a heap of difference.....she's an Indian and I'm not! Yelled Jimmy. "Come on back to the house Jimmy.....I want Neela to tell you something that just might change your mind.....come on son." When they got back to the house Neela was gone. It looked like Reymer had taken her. Jas told Jimmy that he was the only one who could help her now. "How can I help her? We already know she is a no account Indian." Jimmy turned and looked at Jas and told him it was up to Jas. "Jimmy.....you should have been told this a long time ago.....but now your gonna have to hear it from me." "Neela's your mother." Jimmy just stood there looking at Jas. Ji mmy insisted that his mother was dead. Jimmy didn't want to believe Jas. He accused Jas of lying. "Jimmy.....you know I have no reason to lie to you." "That makes me a.....half breed! Even worse!" "Son.....you're what you have always been." "Your mother and father were married in an Indian village." "Because he was ashamed!" accused Jimmy. Jas told Jimmy that his father loved his mother and there was no other place they could be married. Jimmy wished Jas never had told him. 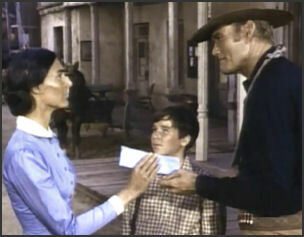 Jas told him they had to get to town and keep them from sending his mother to a reservation. "You mean.....tell everybody?" Asked Jimmy. "No son.....I'll leave that up to you," said Jas. "I can't! I'm not going!" Shouted Jimmy! "I don't need her anymore." "This is my land, I own it now. "Alright Jimmy.....you live with your land!" And when the first hurt comes.....you let the land hold you and comfort you!" "You let the land feed you and dress you!" "Land! Will the land love you Jimmy?" "Will the land nurse your bruises?" "Will it mend your torn shirts.....will the land listen to your problems?" They stood there looking at each other. "Son.....your father was a good man.....but he made a mistake in not telling you and the whole world how much Neela meant to him." "Don't you make the same mistake!" Jimmy started to cry. Jas rode into town. Hannah Reymer was telling everyone that Indians just wasn't a human breed and they were best kept penned up on the reservation. 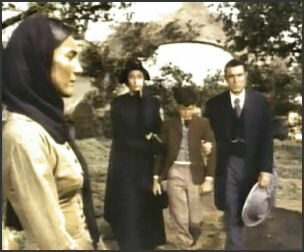 Reymer made it known that Huber was taking Neela back to the reservation right now, it's only fifty miles. She'd be put away safe in just a couple of days. "She's not going anywhere, not yet Reymer!" "I'm going to tell you why," said Jas. "Oh no you won't! You're all through meddling!" "Before God and man, I'm doing what's right!" "That squaw's getting in that buckboard and she's going now!" Said Reymer. "She's not going anywhere!" Said Jas. Huber yelled something about the reservation was too good for her. "The filthy red devils killed my brother!" "My people were killed too!" Shouted Neela. Jas yelled to Neela to come to his side. Huber jumped out of the buckboard and yelled that he would take care of Jas and her too. He started for Jas. Jas hit Huber and knocked him to the ground. Jas turned his back on Huber, just as Huber started to pull his pistol out of his holster. Neela warned Jas. Jas then pulled his broken saber out of his gear and threw it at Huber pinning his arm to the ground with it. "I think it's about time people around here knew the truth Reymer!" Said Jas. "The only reason you want to send Neela away is because you can grab that boy.....because he owns the rights to the water in this territory! The rights you told everybody you controlled! Isn't that right Mr. Reymer?" "Don't listen to him!" "You all know me!" "And I found out about Mr. McCord!" "He's that coward that deserted his men in the battle at Bitter Creek!" "What does his word mean?" 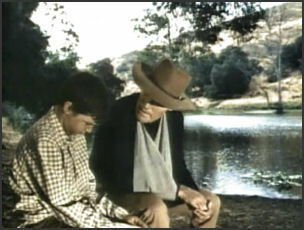 "You don't have to take my word.....this is....." Just as Jas started to take the deposition out of his sling, Jimmy rode up in the buckboard. He jumped off the buckboard and ran toward Reymer yelling....."Leave her alone! Leave her alone!" The he looked up at Reymer and said....."She's my mother!" The town was buzzing'. Reymer grabbed the boy by the arm and said....."You're mother's dead boy!" "This squaw was your nurse!" Jimmy still looking Reymer straight in the eyes said....."She's my mother!" Jas told Reymer that the boy was telling the truth. He then handed the deposition to Reymer to read. "That's a sworn deposition by Sam Whitlaw." "Neela was his wife and she's Jimmy's mother!" Reymer was angry, he scheme didn't work. "Wait.....then this boy is a half breed!" Said Reymer. "That's right Reymer, but he can still own land, legally!" Reymer had no choice but to let them stay. "Now isn't that generous.....I'm sure Jimmy's mother will be just as generous as you!" It will be up to her to decide who Jimmy shares that water with. "Too bad isn't it.....too many people are accepted for what they have and not what they are," said Jas. Neela wanted to thank Jas, but couldn't find the words. "No need to say anything Mrs. Whitlaw," as he handed her the deposition. "Nobody ever called me that before." "Son.....your father would have been mighty proud of you today too," said Jas. "Thank you Mr. McCord, for a lot of things," said Jimmy. "Come on mom, I'll drive ya' home!"